Cryin’ Hound is a comic book character that first appeared in Teenage Mutant Ninja Turtles Adventures #7. 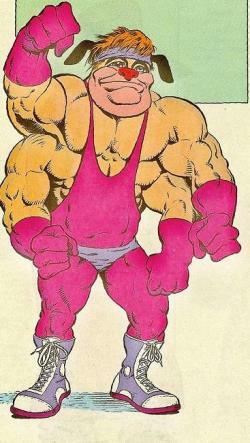 He is an Intergalactic professional wrestler in the Archie Comics. He single handedly fought the Teenage Mutant Ninja Turtles, good thing he has four hands! He had a habit of repeatedly stating what his name was.